The SCM (Smith Corona Marchant) Cogito 412 is a fairly late Nixie tube, yet LSI IC-based, desk calculator. It is a rather basic four-function only machine, but unusual in that it performs just about all its functions in ways different than most calculators of the day. This particular Cogito 412 was likely built in the mid-1970 timeframe, with date codes on IC's ranging from late-1969 through early 1970. The IC's in the machine are made by American Microsystems (AMI). 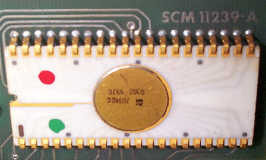 AMI was one of the earliest chip makers to develop large-scale MOS multi-chip calculator ICs, generally fabricating the devices from proprietary logic designs developed by calculator companies. In the case of the Cogito 412 and 414 calculators, the logic design was created by Marchant engineers, and AMI took the logic design and implemented it on the MOS chips. 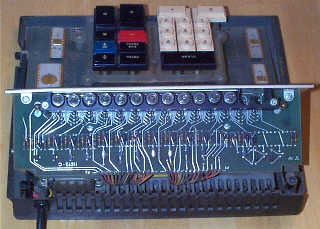 AMI also fabricated complex multi-chip calculator chipsets for Computer Design Corporation (also known as Compucorp), as well as for Tektronix in its Model 21 and 31 calculators). The 412 uses eight LSI IC's to make up the logic of the machine, and a sprinkling of discrete components for pull-ups, Nixie drive, and power-supply functions. Four of the LSI's are plugged into the main board with Molex-style strip IC sockets, with the other four soldered onto two removable daughter-cards that plug into the main card. The machine uses a 12-digit Nixie display, with each tube containing zero through nine, and a decimal point. At the left end of the display, a legend marked "OVERFLOW" can be lit by an incandescent bulb when results of calculations exceed the capacity of the machine. At the right end of the display panel, a "-" legend can be lit up to indicate a negative number in the display. 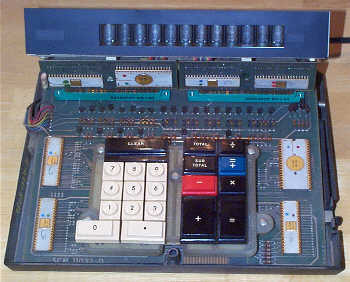 The Cogito 412, while it doesn't have a memory function in the conventional sense, operates in such a way that a memory is part of the intrinsic operation of the machine. The memory is actually an accumulator which is normally not displayed. Looking at the keyboard, one sees the standard "add, subtract, multiply, and divide" keys, but also sees a [TOTAL], [SUBTOTAL], and [=] key, and an unusual blue-colored [=+] key along with the normal [CLEAR] and zero-through-nine/decimal point keys. The accumulator is where the results of addition and subtraction operations are tallied, and it is not displayed unless called upon with the [TOTAL] or [SUB TOTAL] keys. For example, to add 123 to 456, you would press 123, then press the [+] key, then press 456, then press the [+] key again. To see the answer, you could press the [SUB TOTAL] key, which would bring 579 up on the display, or you could press the [TOTAL] key, which recalls the accumulator to the display, and clears the accumulator. To explain this in the context of a more conventional calculator with separate memory function keys, the [+] key actually behaves more like a "M+" key; and the [-] key like a "M-" key; the [SUB TOTAL] key behaves like an "MR" key and the [TOTAL] key acts like pressing an "MR" key, followed by a "MC" key. When first sitting down to use this machine, this scheme takes some getting used to, but actually is rather powerful, with this functionality useful for accumulations of products typically used in financial and statistical applications. Multiplication and division work in algebraic fashion, with the [=] key displaying the result. The [=+] key also generates the result for multiplication and division, but also adds the result of the multiply or divide operation to the accumulator. 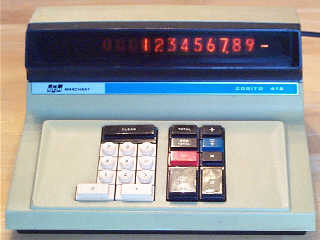 The Cogito 412 is a fixed-decimal point machine, with a very unusual method used for selecting the decimal point position. The [CLEAR] key provides a dual pupose. It's first purpose is obvious...it clears the machine. However, below the [CLEAR] legend on the key, is an (hard to see in the pictures) embossed area of the key which says "DECIMAL POSITION". Pressing down the [CLEAR] key and holding it, and pressing a digit on the keyboard from 1 through 0, selects the decimal point position from 1 digit behind the decimal point, through 10 digits behind the decimal point (when 0 is selected). Also, if a digit key is held down when turning on the calculator, that key is used to determine the decimal point position at power-on. If no key is pressed at power-on, the machine places the decimal point at two digits behind the decimal, most most useful for financial calculations. This method of decimal point selection was patented by SCM Corporation, under US Patent number 3622768. The 412 also is rather unique in the presentation of the Nixie display. The machine does leading and trailing zero suppression in an interesting way. Rather than blanking un-needed zeroes completely, it instead reduces the brightness of the digits to about one-quarter of the brightness of significant digits. Why the designers opted to do this rather than simply blank the digits is perhaps to assure the user that the tubes are actually working at all times. The calculator performs operations fairly quickly, providing a result to 99999999999.9 divided by 1 in less than 1/2 second. Calculations proceed with little fanfare on the display, though the display isn't blanked during calculations, calculations occur fast enough that the display doesn't really jump around all that much. For more information about a companion machine to the Cogito 412, have a look at the Cogito 414 page.